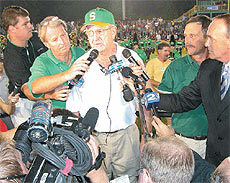 Like many small Southern towns, Summerville has a passion for football, especially since it-s the home of the "winningest" football coach in America, John McKissick. This past season McKissick proved a person doesn-t have to live in New York City or coach at Notre Dame to achieve greatness. McKissick brought the bright lights of the big city to him and the small town of Summerville, population 27,752. "There is a lot of places to coach football," McKissick said. "But none are better than playing here. I have helped put a little town like Summerville on the map." When people ask McKissick why he-s been so successful over the years, he always responds. "I-ve surrounded myself with a lot of good coaches and I-ve had some good players that have made me look good," he said. McKissick added, "I think another thing that helped me along the way is I always have stressed to my coaches never tell a player what he-s doing wrong. Instead show him how to do it right. Always be positive." McKissick-s love for football began when he played midget football in the eighth grade with his good friend Frank McGill. McKissick played running back and McGill played fullback on the offensive line. Kingstree-s 1944 Class Prophecy, written by Ellen Swails, foretold of McKissick-s future endeavors. Swails wrote "… Coach John McKissick of Yale, who was returning from Duke, where he had been visiting Coach Frank McGill." Swails had his profession correct, but the wrong school and level of play. Nonetheless, McKissick did become a coach. With the itch to coach football McKissick returned to Kingstree in 1951 and applied for the head coach job at his alma mater. However McKissick was turned down for the position due to lack of experience. "I would have turned me down, too," McKissick said. "I didn-t have any coaching experience, and I was right out of college." What makes McKissick-s players different from other players in high school is he demands discipline. Every player on McKissick-s team has to have a good haircut, wear no earrings and every player dresses the same on game days. Every player wears the same color shoes and socks (pulled up to the knees) with their uniform. Everybody looks the same on game night - there are no individuals. "If your going to be a team you-ve got to look and act like a team," McKissick said. "Each player has to work towards the same goal and that-s winning the game." McKissick has racked up seven undefeated seasons and two most successful streaks happened from 1978 to 1980 and 1982 to 1984. 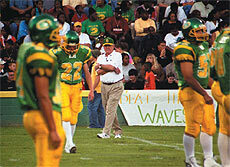 During the 1978 to 1980 stretch the Green Wave won 41 consecutive games and two state titles and a runner-up. The streak ended with a loss to Irmo in the 1980 State Championship game. Summerville had defeated Irmo in 1978 and 1979 to win back-to-back state titles, but in 1980 the Yellow Jackets stung the Green Wave 13-0. 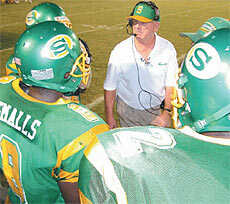 The loss ended the longest winning streak in McKissick-s time at Summerville.